Ever thought making Jam was too difficult? Why not try Lemon Curd instead - its easy and you don't need any special equipment. Just put together 12 ounces of sugar and 5 ounces of butter or margarine in a bowl that can take heat ( a pyrex mixing bowl is great). Now grate the outer zest off 3 very big or 4 medium lemons. Don't worry if you can't get it all -but it adds a lovely 'zing' to the curd. Then juice the lemons (tip - to get the most juice out, just warm them for 5 seconds in the microwave). Put the juice and zest into the bowl with the sugar and butter. Get a saucepan half full of water - you need to be able to sit the bowl on top of the saucepan comfortably. Then bring the water to the boil and keep it bubbling, warming the bowl and its contents. 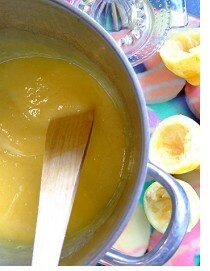 Give it the odd stir with a wooden spoon - the butter and juice wiil mix and dissolve the sugar. While you're waiting for this, beat up three good sized eggs and add two egg yolks (tip - you can seperate the egg yolks by half cracking the eggs and letting the whites drip into a bowl). When the mixture has just about melted together, whisk in the eggs. Keep an eye on this now, and stir - you'll see the curd start to get thick on the edges of the bowl as it 'cooks'. When you can feel its all thick, its done! This only takes about ten minutes - if that. Makes about two jam jars - or the filling for a lemon meringue pie and a small jar left over. If you put into jars, remember to have them warm and sterile first ( the microwave is great for this, but watch for metal tops). Best kept refrigerated. If you fancy something different, add a lime instead of one of the small lemons.